A great mini-starter set for the young beginner, rated age 3+. Battery-operated locomotive pulls a car around a 6-foot circular track, more-or-less HO scale. Our experts make sure these items are ready to enhance your layout. Inventory changes regularly and all items are value priced! 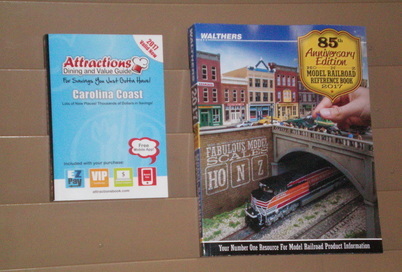 Whether you're looking for unique souvenirs of a visit, games or toys for youngsters, or railroad books or videos, the Gift Shop has distinctive items for your interests. Our extensive selection includes toys, games, jewelry, apparel, books for all ages, photography, vintage items, CDs and DVDs, and more. In addition, a professionally-built model provides visitors with an interactive glimpse of this fascinating past-time. Now available! Great titles for kids! From Usborne, a light-hearted look at textures and descriptions – “That’s Not My Train” ($9.99), and “Trains,” a lift-and-look book that lets kids find the teddy bear in each picture ($9.99), and “Trains” by Emily Bone, a simple reader that explores how trains work, different styles of locomotives, and more, along with website links for further reading ($4.99). Action books now in stock – “Inside Freight Trains,” where the pages slide out to reveal contents of freight cars (($9.99), and “Rolling On The Rails,” a Thomas & Friends card book on wheels ($8.99). “I Love Trains” is an early reader rhyming book that introduces young train fans to different kinds of cars (15.99), and “I Saw An Ant On The Railroad Track” by Joshua Prince is a humorous rhyming story about a switchman and a new friend ($14.95). From Melissa & Doug, the premier maker of learning toys and games for youngsters, we now have “Alphabet Train Lacing Beads,” a dexterity and ordering game ($14.99) , “Train Cars,” an 8-piece set of magnetized cars compatible with popular track ($17.99), “Train Sound Puzzle,” a game that lets kids hear the whistle, bell or wheels ($12.99), “Choo Choo Locomotive,” a plush toy for infants and toddlers, complete with sound and motion ($18.99). Annual releases! the 2017 edition of “Attractions Dining & Value Guide,” offering deals and coupons to hundreds of restaurants, attractions, shops and more, all valid from now to the end of 2017! Sales of this valuable guide directly benefit the museum ($25.00). It may still be warm, but cooler weather is on the way. 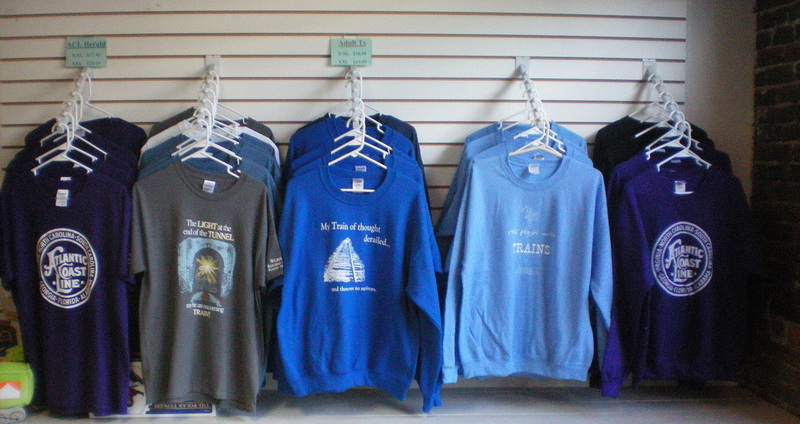 Check out our selection of sweatshirts now available in the Gift Shop. The distinctive ACL design is always popular, screened in white against vivid purple, the ACL colors from 1939-1957. Humorous thoughts are on display with other shirts, including “My train of thought derailed … there were no survivors.” or “The light at the end of the tunnel .. may be an oncoming train.” or “Still plays with trains.” for the adult enthusiast. All styles only $23.99. This volume reprints a summary of the railroad's history as published in 1930, along with a condensed history through 1990 by Charles Kernan. 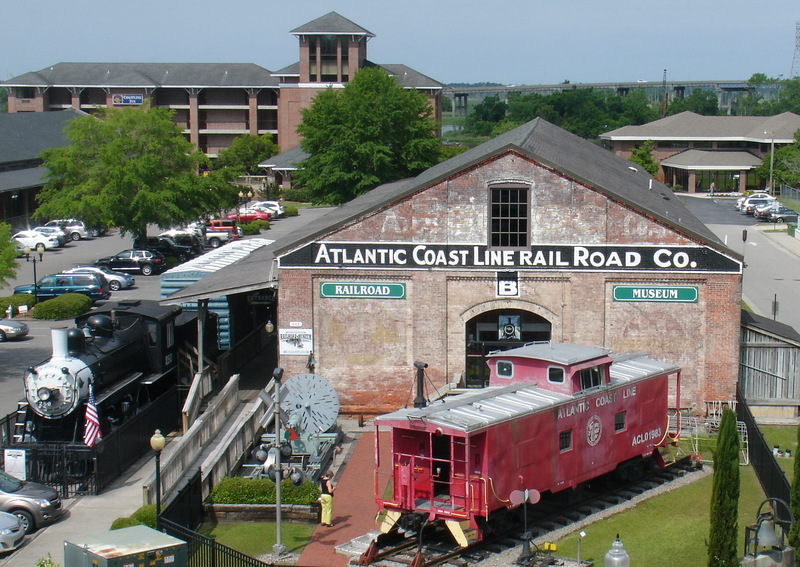 Privately published by CSX Railroad in 1998, this book presents the thorough research of Glenn Hoffman in tracing the growth and development of the Atlantic Coast Line from its roots in the 1830s to its merger with Seaboard Air Line in the 1960s. Photographs and maps help illustrate the story, along with a "family tree" of how the various constituent short lines were combined to form the "The Standard Railroad of the South." In this 1985/1995 monograph, Charles Kernan explores and maps out the several old rail routes that once served Wilmington. With rare and unusual photographs, the traces of former activity are detailed, recalling the heyday of Wilmington as a railroad center. This 2006 sequel to Volume 1 presents floor plans and elevation drawings of many of the buildings that once anchored the activity in downtown Wilmington. to obtain a list of current holdings. On occasion we will update the list of available books; however, please call us if you wish to verify availability prior to ordering. Some of these are rare and out of print books and will not be available once sold. Privately published in 1998, this memoir by Gwendolyn Cottman summarizes the work done by African-Americans in various railroad trades and occupations. NEW WORKS: We carry many other titles for all ages, including Thomas storybooks, special interest railroad books, vintage periodicals, and recorded items. If you would like to purchase, please call (910) 763-2634 for information.